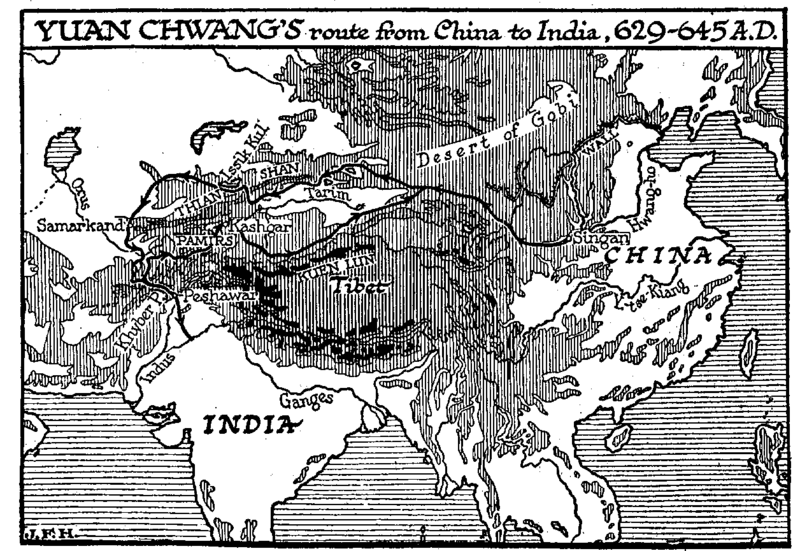 Figure 562: Map — Yuan Chwang’s route to India, 629-645 A.D. In the year 629, the year after the arrival of Muhammad’s envoys at Canton and. thirty odd years after the landing of Pope Gregory’s missionaries in England, a certain learned and devout Buddhist named Yuan Chwang started out from Sian-fu, Tai-tsung’s capital, upon a great journey to India. He was away sixteen years, he returned in 645, and he wrote an account of his travels which is treasured as a Chinese classic. One or two points about his experiences are to be noted here because they contribute to our general review of the state of the world in the seventh century A.D.
Yuan Chwang was as eager for marvels and as credulous as Herodotus, and without the latter writer’s fine sense of history; be could never pass a monument or ruin without learning some fabulous story about it; Chinese ideas of the dignity of literature perhaps prevented him from telling us much detail of how he travelled, who were his attendants, how he was lodged, or what he ate and how he paid his expenses-details precious to the historian; nevertheless, he gives us a series of illuminating flashes upon China, Central Asia, and India in the period now under consideration. His journey was an enormous one. He went and came back by way of the Pamirs. He went by the northern route crossing the desert of Gobi, passing along the southern slopes of the Thien Shan, skirting the great deep blue lake of Issik Kul, and so to Tashkend and Samarkand, and then more or less in the footsteps of Alexander the Great southward to the Khyber Pass and Peshawar. He returned by the southern route, crossing the Pamirs from Afghanistan to Kashgar, and so along the line of retreat the Yue-Chi had followed in the reverse direction seven centuries before, and by Yarkand, along the slopes of the Kuen Lun to rejoin his former route near the desert end of the Great Wall. Each route involved some hard mountaineering. His journeyings in India are untraceable; he was there fourteen years, and he went all over the peninsula from Nepal to Ceylon. At that time there was an imperial edict forbidding foreign travel, so that Yuan Chwang started from Sian-fu like an escaping criminal. There was a pursuit to prevent him carrying out his project. How he bought a lean red-coloured horse that knew the desert paths from a strange grey-beard, how he dodged a frontier guard-house with the help of a «foreign person» who made him a bridge of brushwood lower down the river, how he crossed the desert guided by the bones of men and cattle, how he saw a mirage, and how twice he narrowly escaped being shot by arrows when he was getting water near the watch-towers on the desert track, the reader will find in the Life. He lost his way in the desert of Gobi, and for four nights and five days he had no water; when he was in the mountains among the glaciers, twelve of his party were frozen to death. All this is in the Life; he tells little of it in his own account of his travels. He shows us the Turks, this new development of the Hun tradition, in possession not only of what is now Turkestan but all along the northern route. He mentions many cities and considerable cultivation. He is entertained by various rulers, allies of or more or less nominally tributaries to China, and among others by the Khan of the Turks, a magnificent person in green satin, with his long hair tied with silk. «The gold embroidery of this grand tent shone with a dazzling splendour; the ministers of the presence in attendance sat on mats in long rows on either side all dressed in magnificent brocade robes, while the rest of the retinue on duty stood behind. You saw that although it was a case of a frontier ruler, yet there was an air of distinction and elegance. The Khan came out from his tent about thirty paces to meet Yuan Chwang, who, after a courteous greeting, entered the tent… . After a short interval envoys from China and Kao-chang were admitted and presented their despatches and credentials, which the Khan perused. He was much elated, and caused the envoys to be seated; then he ordered wine and music for himself and them and grape-syrup, for the pilgrim. Hereupon all pledged each other, and the filling and draining of the wine cups made a din and bustle, while the mingled music of various instruments rose loud: although the airs were the popular strains of foreigners, yet they pleased the senses and exhilarated the mental faculties. After a little, piles of roasted beef and mutton were served for the others, and lawful food, such as cakes, milk, candy, honey, and grapes, for the pilgrim. After the entertainment, grape syrup was again served and the Khan invited Yuan Chwang to improve the occasion, whereupon the pilgrim expounded the doctrines of the ‘ten virtues,’ compassion for animal life, and the paramitas and emancipation. The Khan, raising his hands, bowed, and gladly believed and accepted the teaching». Yuan Chwang’s account of Samarkand is of a large and prosperous city, «a great commercial entrepôt, the country about it very fertile, abounding in trees and flowers and yielding many fine horses. Its inhabitants were skilful craftsmen, smart and energetic». At that time we must remember there was hardly such a thing as a town in Anglo-Saxon England. As his narrative approached his experiences in India, however, the pious and learned pilgrim in Yuan Chwang got the better of the traveller, and the book becomes congested with monstrous stories of incredible miracles. Nevertheless, we get an impression of houses, clothing, and the like, closely resembling those of the India of today. Then, as now, the kaleidoscopic variety of an Indian crowd contrasted with the blue uniformity of the multitude in China. In the time of Buddha it is doubtful if there were reading and writing in India; now reading and writing were quite common accomplishments. Yuan Chwang gives an interesting account of a great Buddhist university at Nalanda, where ruins have quite, recently been discovered and excavated. Nalanda and Taxilla seem to have been considerable educational centres as early as the opening of the schools of Athens. The caste system Yuan Chwang found fully established in spite of Buddha, and the Brahmins were now altogether in the ascendant. He names the four main castes we have mentioned in Chap. XVIII, sec 4 (q.v. ), but his account of their functions is rather different. The Sudras, he says, were the tillers of the soil. Indian writers say that their function was to wait upon the three «twice born» castes above them. But, as we have already intimated, Yuan Chwang’s account of Indian realities is swamped by his accumulation of legends and pious inventions. For these he had come, and in these, he rejoiced. The rest, as we shall see, was a task that had been set him. The faith of Buddha which in the days of Asoka, and even so late as Kaniska, was still pure enough to be a noble inspiration, we now discover absolutely lost in a wilderness of preposterous rubbish, a philosophy of endless Buddhas, tales of manifestations and marvels like a Christmas pantomime, immaculate conceptions by six-tusked elephants, charitable princes giving themselves up to be eaten by starving tigresses, temples built over a sacred nail-paring, and the like. We cannot give such stories here; if the reader likes that sort of thing, he must go to the publications of the Royal Asiatic Society or the India Society, where be will find a delirium of such imaginations. And in competition with this Buddhism, intellectually undermined as it now was and smothered in gilded decoration, Brahminism was everywhere gaining ground again, as Yuan Chwang notes with regret. Side by side with these evidences of a vast intellectual decay in India we may note the repeated appearance in Yuan Chwang’s narrative of ruined and deserted cities. Much of the country was still suffering from the ravages of the Ephthalites and the consequent disorders. Again and again we find such passages as this: «He went north-east through a great forest, the road being narrow, dangerous path, with wild buffalo and wild elephants, and robbers and hunters always in wait to kill travellers, and emerging from the forest he reached the country of Kou-shih-na- ka-lo (Kusinagara). The city walls were in ruins, and the towns and villages were deserted. The brick foundations of the ‘old city’ (that is, the city which had been the capital) were above ten li in circuit; there were very few inhabitants, the interior of the city being a wild waste». This ruin was, however, by no means universal; there is at least as much mention of crowded cities and villages and. busy cultivations. The Life tells of many hardships upon the return journey: he fell among robbers; the great elephant that was carrying the bulk of his possessions was drowned; he had much difficulty in getting fresh transport. Here we cannot deal with these adventures. The return of Yuan Chwang to Sian-fu, the Chinese capital, was, we gather, a triumph. Advance couriers must have told of his coming. There was a public holiday the streets were decorated by gay banners and made glad with music. He was escorted into the city with great pomp and ceremony. Twenty horses were needed to carry the spoils of his travels; he had brought with him hundreds of Buddhist books written in Sanskrit, and made of trimmed leaves of palm and birch bark strung together in layers; he had many images great and small of Buddha, in gold, silver, crystal, and sandal-wood; he had holy pictures, and no fewer than one hundred and fifty well authenticated true relics of Buddha. Yuan Chwang was presented to the emperor, who treated him as a personal friend, took him into the palace, and questioned him day by day about the wonders of these strange lands in which he had stayed so long. But while the emperor asked about India, the pilgrim was disposed only to talk about Buddhism. The subsequent history of Yuan Chwang contains two incidents that throw light upon the mental workings of this great monarch, Tai-tsung, who was probably quite as much a Moslem as he was a Christian or a Buddhist. The trouble about all religious specialists is that they know too much about their own religion and how it differs from others; the advantage, or disadvantage, of such creative statesmen as Tai-tsung and Constantine the Great is that they know comparatively little of such matters. Evidently the fundamental good of all these religions seemed to Tai-tsung to be much the same fundamental good. So it was natural to him to propose that Yuan Chwang should now give up the religious life and come into his foreign office, a proposal that Yuan Chwang would not entertain for a moment. The emperor then insisted at least upon a written account of the travels, and so got this classic we, treasure. And finally Tai-tsung, proposed to this highly saturated Buddhist that he should now use his knowledge of Sanskrit in translating the works of the great Chinese teacher, Lao Tse, so as to make them available for Indian readers. It seemed, no doubt, to the emperor a fair return and a useful service to the fundamental good that lies beneath all religions. On the whole, he thought Lao Tse might very well rank with or even a little above Buddha, and therefore that if his work was put before the Brahmins, they would receive it gladly. In much the same spirit Constantine the Great had done his utmost to make Arius and Athanasius settle down amicably together. But naturally enough this suggestion was repulsed by Yuan Chwang. He retired to a monastery and spent the rest of his years translating as much as he could of the Buddhist literature he had brought with him into elegant Chinese writing.